There’s really no disputing that New York City has a culinary culture surpassing all others, with eateries that appeal to the most discerning of palates in settings that range from traditional to trendy. Restaurateurs recruit world-class chefs to create new and exciting dishes that either set or follow the latest trends all while designing dining rooms that create a mood or communicate an attitude. After all, in New York City, it’s all about being hip, trendy and innovative, right? Stop right there. Peter Luger Steak House isn’t influenced by fleeting trends and changing demographics. The legendary Brooklyn establishment has been doing the same thing, the same way for 127 years and that’s exactly what brings people here again and again, not only from all over the city, but from all over the country and all over the world. The more things change, the more Peter Luger stays the same. For most businesses, maintaining status quo would virtually guarantee failure, but Peter Luger isn’t like most businesses. The steak house has been family owned and operated since Sol Forman purchased it in 1950 following the death of Peter Luger. Forman had established, Forman Family, a metal and silverware company across the street from the popular steak house in the Williamsburg neighborhood of Brooklyn. It quickly became a favorite place for him to take prospective clients for lunch. Sol himself was known to have two steaks there every day. When Peter Luger died, the place fell into disrepair and was put up for auction. Rather than seek out a new place to take clients, Sol decided to purchase Luger’s at auction and was subsequently the only bidder. Able to purchase the restaurant for only the price of the real estate, he sought to return the establishment to its former glory. That focus, along with his acute business acumen established Peter Luger as a premium steak house that has remained New York’s top-rated steak house for many years. That may be a bit of an under statement. 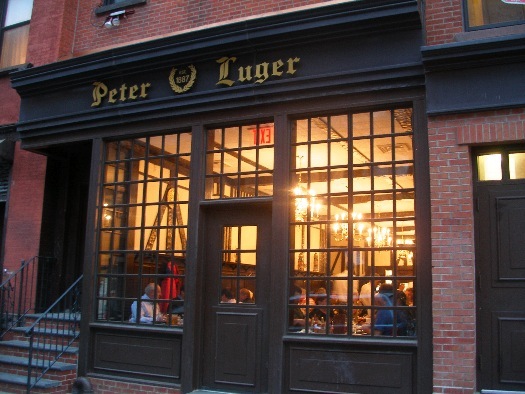 This year (2014) the Zagat Survey rated Peter Luger NYC’s No. 1 steak house for the 30th consecutive year, praising not only the quality of the food, but the unchanging atmosphere and the “no-frills, boy’s club,” ambiance as adding to the lure of the place. Over the years, the press has raved over Peter Luger noting the consistency of the food, service and atmosphere. This consistency is exactly what makes this steak house stand out among all the others. Simplicity wins the day at Peter Luger. The menu isn’t very big (steak and potatoes variations); the décor is plain and marketing is minimal. Sure, you can buy a Peter Luger t-shirt from the front counter, and Peter Luger Old Fashioned Steak Sauce is also available for purchase, but you won’t find a gift shop here. Unlike most modern restaurants, Peter Luger is a cash only establishment unless you have a Luger card (Sol Forman introduced the store account long before The Gap and Bloomingdale’s). The reservation list is hand-written as is your check when you pay for your meal. Every steak is USDA Prime and meets Peter Luger standards. “My grandmother was taught to inspect meat by a retired USDA grader who didn’t want to be paid,” Jody explains. “All he wanted was a new TV set.” Her grandmother subsequently taught her mother who, in turn, taught her. As a family run business, Peter Luger maintains quality with its ability to supervise all aspects of the business. “We don’t really follow trends,” David explains. “But what you get at Peter Luger is hot food on a hot plate on a hot platter. It’s still sizzling when it comes to your table. You don’t get that at many places anymore. It’s always a worthwhile trip across the East River from Manhattan to dine at Peter Luger at 178 Broadway (at Driggs Ave.) in Brooklyn. Reservations are not taken online, call the restaurant directly at (718) 387-7400.